MALAKA, Gaza Strip (AP) — Atalla Fayoumi hobbles on crutches across the sunbaked plain near Israel’s perimeter fence in the Gaza Strip, gazing toward plumes of smoke that have begun rising from a clutch of burning tires in the distance. The 18-year-old Palestinian’s right leg was amputated after Israeli soldiers shot him here in April at one of the mass demonstrations against Israel’s long blockade of Gaza that are held every week. Yet he has kept returning to the protests — just like thousands of other desperate, unemployed men who feel they have nothing left to lose. Eight months after the demonstrations began, there appears to be no end to what has become a predictable routine that yields dozens of new casualties each week. Over the next few hours, Fayoumi knows the crowds will swell into the thousands. They’ll burn so many tires, the sky will turn black. They’ll attack the fence with stones and firebombs, Israeli gunfire will ring out, and Palestinian ambulance sirens will wail non-stop. By the time it is over, at least 80 Palestinians will be wounded and three will be dead. At sunset, Fayoumi and the others will abruptly turn around and walk home, while the Israelis will emerge from their positions and march the other way. In a week, like clockwork, they will be back, poised for the deadly ritual to start all over again. The Gaza Strip has been the front line of confrontations between Palestinians and Israel for generations. But the territory has been brought to its knees over the last decade by three punishing wars with Israel and an air, sea and land blockade. The 11-year blockade, imposed by Israel and Egypt, is aimed at weakening Hamas, the militant group that seized power in Gaza from the internationally-backed Palestinian Authority in 2007. But its impact is felt by all. Raw sewage flows directly onto once-scenic Mediterranean beaches, tap water is undrinkable, and electricity is available just a few hours a day. Over half the Gaza Strip’s 2 million people are unemployed, and most residents cannot leave what has become, in essence, a mass prison, even for medical reasons. The blockade and growing anger over the harsh living conditions have put enormous pressure on Hamas, which is trying to redirect it toward Israel with relentless protests, said Mkhaimar Abusada, an associate professor of political science at Gaza’s al-Azhar University. That almost happened this month, when an Israeli raid into Gaza left seven Palestinian militants and a senior Israeli military officer dead. The raid prompted Hamas and other armed groups to fire hundreds of rockets and mortar shells into Israel, triggering a devastating wave of Israeli airstrikes in return — the heaviest fighting here since a 2014 war. Both parties pulled back from the brink with a truce, and Hamas kept last Friday’s protests restrained — though not enough to keep 40 Palestinians from being wounded. While most Gazans see the protests as the inevitable reaction to Israel’s siege, Israel has a different view altogether. Since they began March 30, Israeli troops — using live ammunition against Palestinians mostly armed with rocks — have killed more than 170 people and shot nearly 6,000 others, among them scores of children. Thousands more have been wounded during the protests by tear gas or rubber-coated bullets. On the Israeli side, one soldier has been killed by a sniper and six others wounded. Every Friday, there are more. It is 2:30 p.m. in Malaka, one of five protest sites along the border, and several boys are practicing for a fight. They are flinging large rocks onto a barren field with homemade slingshots. One of them, 17-year-old Ahmed al-Burdaini, shows off a bucket filled with fragments of steel rebar he says he spent the week collecting from the rubble of homes destroyed in past Israeli airstrikes. “We want to use it against them,” he says proudly. Another boy points across the frontier and writes in a reporter’s notebook: “This Is Our Land.” It is a reference to another demand of the protests, that Palestinians be allowed to return to lands lost during the 1948 war that created the Jewish state — a demand Israel rejects outright. The perimeter fence itself is a few hundred meters (yards) away. Israeli soldiers on the other side peer out from bunkers built atop pyramid-shaped berms along the fence. The protest site is still largely empty, but people are trickling in. Among them is the amputee, Fayoumi, who says he was throwing rocks near the fence and was shot as he rushed to help a wounded friend. A few days earlier, speaking at a clinic run by Doctors Without Borders, he swore he would keep participating in the protests despite his wounds. But why risk it? “Because I want to die,” he said. The sun is bearing down intensely when a couple dozen Palestinians roll a few tires toward the fence and set them on fire. The first gunshots ring out at 3:14 p.m., in the standard Israeli response to the start of the protests. An armored Israeli jeep at the edge of the fence fires a volley of tear gas canisters that leave white arcs trailing across the sky as they fall. The protesters are unfazed. Among the growing crowds is an incongruous sight: five street vendors pushing dilapidated food carts hawking seeds, nuts, and frozen slushies. One is affixed with a cheap wooden speaker blaring traditional Bedouin music. It gives the protest the atmosphere of a country fair. Plainclothes Hamas security agents appear. A local television crew arrives with flak jackets and helmets. A single ambulance pulls up. After Friday noon prayers, around 4 p.m., Hamas dispatches huge buses to many mosques to bring supporters to the border. But many more come on their own — on foot, in cars, motorcycles, bikes and wheelchairs. Within one hour, at least 13,000 people are gathered along the border. Dr. Khalil Siam is standing inside a medical triage tent about a kilometer (half a mile) from the border when the ambulance sirens begin to howl just after 5 p.m. The first one to arrive drops off a 22-year-old man who was shot in the left leg. The second brings an 18-year-old, blood streaming from his bandaged face, who was struck by shrapnel. When the third comes shortly after, bearing a 31-year-old shot in the chest, there is shouting and panic — and no doubt the most dangerous phase of the protests has begun. The bullet has punctured the man’s lung, and he is lowered gently onto a gurney as eight doctors and nurses gather round. One of the doctors inserts a clear tube into the man’s chest, and within seconds, blood and liquid is draining into a blue plastic bowl on the floor. Outside, a convoy of vehicles passes. Young men are standing on them, thrusting fists in the air, their faces hidden with scarves and white Guy Fawkes masks. It is the “Burning Tire Unit” — and soon it will fill a vast section of the frontier with a wall of fire and billowing sheets of smoke. A few dozen meters (yards) away, five men in checkered, black and white headscarves are performing a traditional folk dance with their arms crossed for a captivated crowd under a massive tent. Behind them, in the distance, the border fence looks like a war zone; the sky is completely black, burning tires are shooting flames into the air, and gunfire is ringing out every few minutes. But nobody is looking toward the border, and few notice the steady stream of ambulances that are crisscrossing the adjacent road, non-stop. Here, vendors are selling corn on the cob and peanuts, and fathers are balancing children on their shoulders. In the sky behind the stage, four kites flutter in the wind, several with flaming, incendiary trails; such kites have burned thousands of acres of Israeli farmland and set vehicles alight. Colorful balloons also float overhead; Israel says they have found them on the other side of the fence, tied to small, homemade bombs. By 6 p.m., at the border, all hell is breaking loose. Hundreds of hard-core protesters are swarming the 12-foot-high fence. The wall of smoke has allowed some, armed with wire cutters, to clip through the rolls of barbed wire. One man is hanging from the top of the fence, shaking it back and forth with the weight of his body. Another is hanging from the other side, and yet another is trying to melt the fence with a flaming tire. The noise here is constant, like a waterfall. Men are blowing whistles. Others are screaming at the top of their lungs. “Allahu akbar!” — God is greatest! Most are throwing rocks over the fence, thrusting their fists in the air, taking selfies, making the V sign for Victory. There are women too, wearing black and waving Palestinian flags. There is a man with a speaker on his back, playing Palestinian music to encourage them. Some boys pick up smoking tear gas canisters and smack them back over the fence with tennis rackets. Every time a gunshot rings out, the crowds duck, like a school of fish darting in unison. Sometimes a man falls, and within seconds he is surrounded by medics in orange uniforms, who bandage him on the spot and rush him on a stretcher to the ambulances waiting in the rear. Further back stands a vast sea of spectators. One, an older man named Khalil Ayesh, is sitting inside a light blue Subaru with his family, as if he has come to a drive-in movie. He was in the same spot last week, watching intently as an Israeli drone crisscrossed the sky like a black spider, dropping tear gas on the crowds from above. After the sun sets, the crowds dissipate rapidly as two black drones circle overhead. At 6:52 p.m., a huge blast a kilometer from the frontier sends shards of concrete and debris hurling into the air. Eight minutes later, it happens again. Later, in a statement, the Israeli army will say that aircraft and a tank struck two Hamas watchtowers after one of their soldiers was wounded by a pipe bomb. It is time to go. At the medical tent, it is now pitch dark, and the last casualty arrives at 7:24 p.m. It is a man, bleeding from the head, who has been hit by a tear gas canister. Siam says his team treated 25 people on this Friday, mostly for gunshot wounds. Half were shot in the leg, the others in the chest, stomach, back, pelvis. One doctor had to take leave when his nephew arrived, shot in the head. Almost every Friday protest in Gaza is followed by at least one funeral on Saturday. This week, there are three. One, for an 11-year-old boy named Shady Abdel-al, is remarkable because it is quiet. Funeral processions here typically are accompanied by young men doing something they usually avoid at the border: firing Kalashnikov rifles into the sky. During his funeral, Gaza’s political complexity is laid bare. His body has been wrapped in a yellow flag with a grenade and automatic rifle on it; it belongs to Fatah, the party of Palestinian President Mahmoud Abbas and a bitter rival to Hamas. 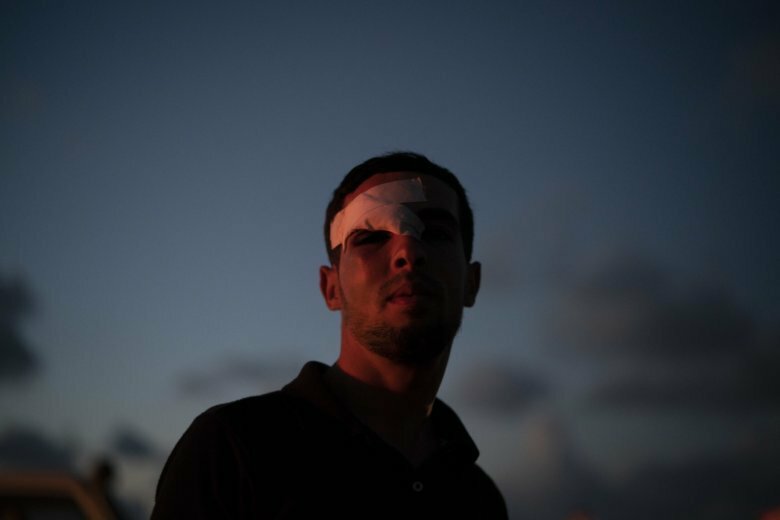 Abdel-al’s mother, Isma, says she told the boy not to go, but he boarded a bus to the border organized by Hamas, whose supporters were teaching him the Quran. As the boy’s body is carried through the neighborhood, it is surrounded by a sea of yellow flags. But when it reaches the mosque, there is another huge group of teenagers waiting with the green flag of Hamas. Hassan Walli, a Fatah official, is with the family as the distraught father stands over his son, kissing him on the forehead. It is Sunday in Gaza, and Atalla Fayoumi is sitting on the small bed in his small room, showing off pictures of himself at Friday’s protest. After his injury, Fayoumi received a payment of US$200 from Hamas. It was spent long ago, he says, on medical bills. Now he has nothing. No work. No hope. And little else to lose. Next Friday, he says, he will return to the protests again.